Home > DirectX	> C# DirectX API Face-off: SlimDX vs SharpDX – Which should you choose? As with most such things, all choices have their pros and cons. Here I will look at the two frameworks most currently in use at the time of writing: SlimDX and SharpDX. Why choose C# for games and graphical applications? Actually, as a general rule, I strongly advise all users to write their games in C++ where possible. Almost all commercial game development is done in C++, using C# decreases portability between platforms and incurs a small (perhaps 1-2%) performance hit due to the extra abstraction layer you will be using over the standard C++ DirectX API. Obviously, if you’re a hobbyist coder, there is no need to get embroiled in C++, and if you’re a commercial outfit, using C# to prototype will get you up and running with less boilerplate code and memory management woes than C++. In all other cases, C++ is the preferred choice. Note that in this article, I shall not be assessing the relative performance of SlimDX and SharpDX against each other, or against the native C++ DirectX API. So what are these APIs? Well, SlimDX is an OOP-ified version of the C++ DirectX API written in C#, with some tweaks. It is updated as and when Microsoft release updates to DirectX itself. SharpDX uses a different approach, instead generating C# wrapper calls directly from the C++ DirectX API header files, meaning that unlike SlimDX, every method, property etc. available in the C++ DirectX API is also available in SharpDX. SlimDX was the first product to arrive, and as such SharpDX has tried to encourage users to switch by making it largely syntactically compatible with SlimDX, using the same object and field names in most places etc. Both products are free for commercial use. If you are a professional user, the first thing to note is that SlimDX has not been updated since the start of 2012. In fairness, neither has DirectX itself to any major degree, but it would appear that development has stopped on SlimDX and the web site no longer seems to be maintained as it contains a number of out-of-date pieces of information. On the other hand, the documentation for SharpDX – if you could call it that – is awful, and as you will see below I had quite a headache preparing some example code for this article. Production of code for SlimDX was quite smooth thanks to reasonable-to-good documentation on the web site. SlimDX would appear to have the larger user base at present, so it may be easier to find help online from other users for SlimDX, however there is plenty of knowledge available from users of both frameworks. Despite the lack of tutorials on the official sites (SlimDX only provides 3 or 4 very basic tutorials), note that tutorials for both products can of course be found on various independent web sites. In terms of features, only SharpDX supports Metro apps, Windows Phone 8, builds for Mono and .NET Any CPU support without requiring assemblies to be installed into the GAC, which is a potential minor inconvenience for the end-users of your software. SharpDX is also the only library of the two to offer a higher-level API – the SharpDX Toolkit – which abstracts away some of the complexity and boilerplate code. Note that neither library provides support for Xbox 360 development (use XNA for that, it is your only choice). In terms of trust, SlimDX has a proven track record, having been used in a number of high-profile video game titles from recent years. SharpDX does not have this track record yet, however most of the upcoming breed of C# “game engines” are based on SharpDX, so we will likely see a rise in use soon. One important difference between the two APIs is the way COM objects are managed. SlimDX uses an object table to track the lifetime of COM objects and map them to SlimDX objects. It deals with duplicate instances for you (reference counting) but you must dispose of any objects you create. SharpDX leaves it up to the programmer to manage object lifetime, providing no middle management layer. Both have their pros and cons, and really, both go against the grain of .NET programming where you shouldn’t normally need to care about object lifetimes; however it is worth noting that the SlimDX solution – while making life for the user more consistent – does impose a small performance penalty. Now let’s have a look at what it’s like to write code using these APIs. Here I will show how to create an exact clone of the MSDN Direct2D QuickStart application (see MSDN: Creating A Simple Direct2D Application and MSDN: Direct2D QuickStart (Windows 7 versions linked, a Windows 8 tutorial is also available via the links but the code is incorrect at the time of writing). This is a hideously bloated mess which takes over 400 lines to implement in C++, producing the image shown in figure 1. For this example I will assume you have a basic knowledge of the components of DirectX and some basic experience writing simple DirectX applications. I shall use the latest techniques from Direct2D 1.1 – that is to say, using DXGI to deal with creating the render target, rather than the out-dated HwndRenderTarget interface from Direct2D 1.0. More details can be found in my article Direct2D 1.1 Migration Guide for Windows 7 Developers. Please note that the example is purely for educational purposes and should not be used as a comparison between the coding complexity of the two APIs, especially since most of it is initialization boilerplate code. Both frameworks have NuGet packages available, so just choose Manage NuGet packages… in Visual Studio to install them the easy way. SlimDX requires System.Drawing because the System.Drawing.Color object is used to specify colours. SharpDX uses its own SharpDX.Color struct for this. The last three definitions for both APIs resolve name conflicts with the imported namespaces for objects we want to use. Note that SharpDX uses DXGI.Factory1 rather than DXGI.Factory to indicate the use of DXGI 1.2 as released in conjunction with Direct2D 1.1. // The BgraSupport flag is needed for Direct2D compatibility otherwise RenderTarget.FromDXGI will fail! Both APIs provide a RenderForm object which derives from System.Windows.Forms.Form and modifies the message pump to be more amenable to the needs of a DirectX application. While SlimDX uses the static member function RenderTarget.FromDXGI to create a render target from a DXGI surface, SharpDX provides an overloaded constructor for the purpose. The field names for DPI and DirectX feature level in RenderTargetProperties differ slightly between the two APIs; otherwise, the code is identical. .NET’s Windows Forms architecture doesn’t play nice with Alt+Enter to switch to full-screen in DirectX applications, so we override its behaviour in both versions and tell Windows Forms to ignore Alt+Enter key presses. Such key presses will be intercepted and processed automatically by DirectX, so we don’t want Windows Forms to interfere with this. Note the difference in method names here: SlimDX uses SetWindowAssociation while SharpDX uses MakeWindowAssociation. The code is the same for both APIs. Both APIs provide a mechanism to allow you to inject custom rendering code into a RenderForm. A static method in each API simply takes the desired RenderForm and rendering function as arguments, then runs it indefinitely until the window is closed. In SlimDX this method is called MessagePump.Run; in SharpDX it is called RenderLoop.Run. Here we have just supplied a lambda function which clears the render target (window) to a white background and calls SwapChain.Present to flip the back buffers. The following code draws the image in figure 1. It should replace the commented line in the section above. As you can see, the arguments are re-ordered as appropriate for what each API expects, and wrapped in Color4 and Vector2 objects where applicable. The complete source code for both versions follows. // The BgraSupport flag is needed for Direct2D compatibility otherwise new RenderTarget() will fail! using (var factory = swapChain.GetParent<FactoryDXGI>())   // Factory or Factory1? I would like to thank Roberto for his SharpDX tutorial repository at GitHub which saved me a lot of hassle while writing the SharpDX version of the example. Check out his repository for tons of good tutorials! As you can see, the code for both versions of the example is very similar, although as noted earlier, this should not be taken as representative of how all applications written using these APIs will look. The availability of documentation and examples, higher-level APIs, support, updates and which API best suits your target platform are essentially the most important deciding factors, since – as shown – both have a fairly clean class-based API which closely resembles that of the COM interfaces used in the C++ DirectX SDK. If I was to speculate, I would predict that SharpDX is the better choice for new projects, with the caveat that the learning curve is steep due to a lack of proper documentation. Since it is just a thin wrapper over the C++ headers, the MSDN documentation can be used and C++ code from other sources can be ported without too much trauma to C#; however, using the un-documented SharpDX Toolkit and other tools which come with the API is another matter entirely. Of crucial importance to professional developers is that SharpDX is still maintained, while SlimDX is not. I hope you found this overview helpful. Please add your own feedback and experiences below! SharpDX and Game Engines – Back to Zero? An interesting discussion of C# game engines on GameDevSE. The forum was shut down, but SharpDx is still being supported and actively developed. Hmm, how does choosing c# make your code less portable? Imo it makes it more portable. If you build an abstraction layer in c# to wrap SlimDx/SharpDx and OpenTK and build all of your code against mono, every platform is supported except the xbox 360 with a 1 button build… No need to port anything. Thanks for making me aware of these two. I’m going to try ’em out right away! PixelFormat = new PixelFormat(Format.Unknown, AlphaMode.Ignore), —– this does not wok for me, how can I fix? This worked from another example – great work Katy!!!! 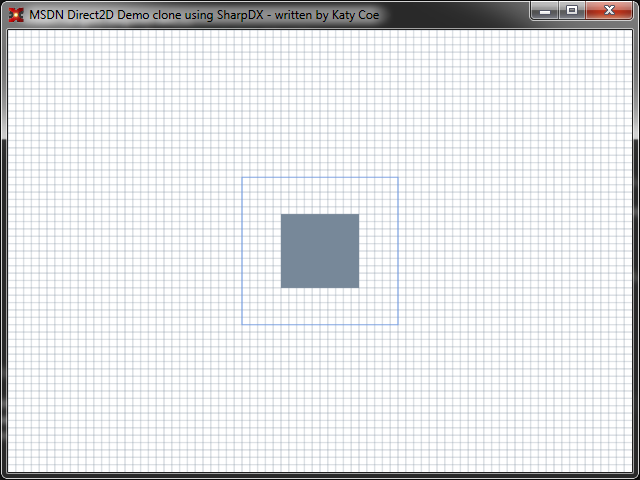 Hi Katy, as per your example on this page (Sharpdx) I am drawing a simple pimal shape (private static SharpDX.RectangleF _ball;) and rendering it using Fillrectangle and a solidbrush (_whiteBrush = new SolidColorBrush(_renderTarget, SharpDX.Color.White); However I would like to give it a slight blur or glow to the edges to mimic an old crt based game (like pong). Any idea how to do this? Hi Katy, on the topic of the performance hit taken by using SharpDX or SlimDX (or another graphical API wrapper) in C#. I’d say that’s actually debatable. While C++ is faster when used correctly, C# removes the human-error element from things like memory-management and makes it reasonably faster to create clean and structured code, which may run faster as a result of being able to apply optimizations easier. I’ve no doubt that big AAA studios with their 10s of programmers can build a game engine that outperforms even the best C# engine, but for smaller studios, That 1-2% performance trade-off is a bargin in terms of the amount of work that C# helps to reduce. Also, If you would like a “AAA quality” game to check out, try Space Engineers. It’s still currently in alpha (bordering on beta), but the graphical fidelity and sheer scale of the game blow many AAA games out of the water. And its written entirely in C# and SharpDX. I forgot to mention that the team that created Space Engineers also have a second game built on the same engine called Medieval Engineers. But that one isn’t as far along. If someone is looging for a graphics and game engine with C# I think Unity3D deserves a big mention. I’m having a big problem with learning from this sample. I’m always getting Direct2DException while initializing the renderTarget. Can someone help me? Hi Katy, thank you for this page very helpfull. I saw there are some memory leaks with the SolidColorBrush in the loop and with the backBuffer. Nice piece! Thank you very much.